- Performance at Hoadley, Hall and Brown, Saturday April 23rd 2016, Anglia Ruskin University. NB This performance/workshop was cancelled. - first performance at Hoadley, Hall and Brown, Saturday April 23rd 2016, Anglia Ruskin University. - Performance at 2:15 Recital Hall, Anglia Ruskin University, 12th May 2015. An interactive sculpture for dancer using data from sensors to help generate notation live, which is then played by the composer and 'cellist Cheryl Frances-Hoad. An automatic composition for computer generated piano and piano. The pianist's music is generated live in performance. A part of Degrees of Synchrony: an original dance and  music performance investigating the boundaries between synchronisation and simultaneity. Tom Hall, Cheryl Frances-Hoad and Richard  Hoadley. Hardware and software interfaces for music performance, in development. Sculptural custom hardware and software interfaces and automatic composition for performers and dancers. Crowdsourced composition and performance controlled by mobile devices. Automatic performance/composition with custom hardware and software. Invited performance using custom built hardware and software, AHRC Workshop, 22nd-23rd March 2010. A component part of Silent Histories: soundscapes and compositions on the themes of stillness, technology and place. 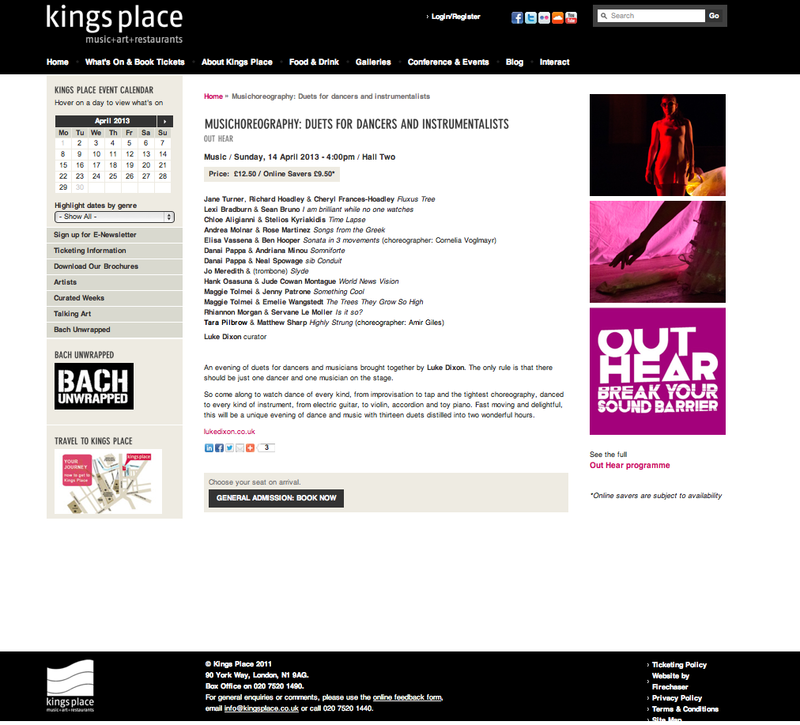 Music and performances by Kerstin Bueschges, Kevin Flanagan, Richard Hoadley and Paul Rhys. MaxMSP and Telephones, concert version approx. 9:29. A melodrama for 'cello and gamelan instruments; 6:26.
and members of the Cambridge Gamelan Society. semi-automatic live performance music for computer, 6:22.
semi-automatic live performance music for computers and synthesisers (pSY). automatic live performance music for computers and synthesisers (pSY), 16:30. Commissioned for Cambridge Digital Arts Festival, June 1999.
automatic live performance music for computers and synthesisers (pSY). Commissioned for Cambridge Digital Arts Festival, June 1998. Commissioned by the Cambridge-Heidelberg-Montpelier Orchestra with funds provided by Eastern Arts, 1994. Commissioned by the Charterhouse Wind Orchestra. for choir and organ or choir and brass quintet, 12:30. Commissioned by the Charterhouse Choir. for violin, clarinet, 'cello, piano, 12:00. Written for the Huddersfield Contemporary Music Festival. Written for the Huddersfield Contemporary Music Festival, 16:10.
for Tenor Voice and Chamber Ensemble, 16:00.
for flute and piano, 20:26. Last modified: November 12 2018 18:45:30.